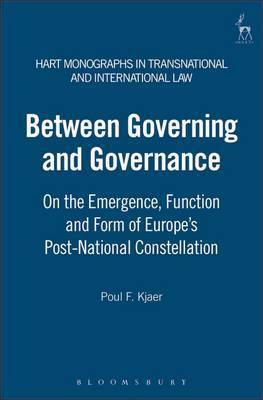 This book explains the emergence and functioning of three forms of governance structures within the context of the European integration and constitutionalisation process: comitology, (regulatory) agencies and the Open Method of Co-ordination. The point of departure is the insight that the intergovernmental/supranational distinction, which most theories of European integration and constitutionalisation rely on, has lost its strength. A new paradigm of EU research is therefore needed. 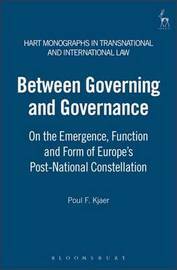 Against this background it is suggested that the distinction between governing and governance provides a more appropriate basis for analysing the phenomenon of integration and constitutionalisation in Europe. The distinction between governing and governance allows for an understanding of the EU as a hybrid consisting of a governing dimension, characterised by legal and organisational hierarchy, and a governance dimension which operates within a network form characterised by legal and organisational heterarchy. The function of governance structures is to ensure the embeddedness of the governing dimension in the wider society. Instead of representing contradictory developments, the two dimensions are therefore mutually constitutive in the sense that more governing implies more governance and vice versa. These theoretical insights are illustrated through two detailed case studies which respectively reconstruct the operational mode of the Open Method of Coordination within EU Research & Development Policy and the regulatory system for the EU chemicals market (REACH). The book is inter-disciplinary in nature and incorporates insights from law, political science and sociology. Poul F Kjaer is Research Fellow at the Cluster of Excellence: Formation of Normative Orders, Goethe University Frankfurt am Main.